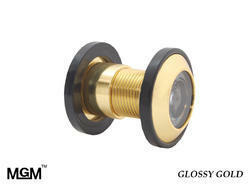 Door viewers are in available finishing as Matt Gold, Matt Silver, Brass Antique, Glossy Gold, Natural Brass and Chrome. Body is made up of brass material and lenses are of glass. Covers viewing area about 180 degree (practically 142°). Fitting (dimensions) : Door Breath 18 mm. to 57 mm. and 25 mm. hole diameter. We have established ourselves as coveted organization, involved in manufacturing, supplying and exporting a premium range of Door Viewers. The door viewers offered by us are manufactured using supreme quality raw material employing latest tools and modernized machinery. All these door viewers are offered in wide range of finishing as per the clients demand such as Matt gold polishing, Matt silver polishing and natural brass polishing. Further, these door viewers are offered in a wide range including Matt Silver Door Viewer, Brass Antique Door Viewer and Matt Gold Door Viewer. Covers actual minimum viewing area 180° (practically >142°). Fitting : Door Breadth 18 mm. to 47 mm. (standard), 26 mm. to 57 mm. (jumbo) and 25 mm. diameter hole for all. 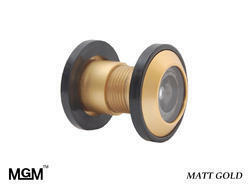 Door viewers in available finishing are Matt Gold, Matt Silver, Brass Antique, Glossy Gold, Natural Brass and chrome. Being a client-centric organization, we are engaged in offering a distinct collection of CHROME (SILVER) that is widely used for safety purposes. Our adept professionals design this door viewer using the finest quality raw material and sophisticated technology in adherence with set industry standards. The provided door viewer is sternly tested against varied parameters by our quality controllers so as to ensure its flawlessness. In line with clients' variegated requirements, we bring forth a distinguished collection of the Door Viewer. The provided door viewer is manufactured under the supervision of our adroit professionals using optimum quality raw material and innovative technology in sync with set industry standards. In order to ensure its durability, this door viewer rigorously tested by our quality examiners on variegated quality norms. 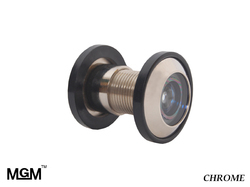 Being a client-centric organization, we are engaged in offering a distinct collection of Brass Antique Door Viewer that is widely used for safety purposes. Our adept professionals design this door viewer using the finest quality raw material and sophisticated technology in adherence with set industry standards. The provided door viewer is sternly tested against varied parameters by our quality controllers so as to ensure its flawlessness. Being a client-centric organization, we are engaged in offering a distinct collection of MATT SILVER that is widely used for safety purposes. Our adept professionals design this door viewer using the finest quality raw material and sophisticated technology in adherence with set industry standards. The provided door viewer is sternly tested against varied parameters by our quality controllers so as to ensure its flawlessness. In line with clients' variegated requirements, we bring forth a distinguished collection of the Door Viewer. The provided door viewer is manufactured under the supervision of our adroit professionals using optimum quality raw material and innovative technology in sync with set industry standards. In order to ensure its durability, this door viewer rigorously tested by our quality examiners on variegated quality norms. Being a client-centric organization, we are engaged in offering a distinct collection of GLOSSY GOLD that is widely used for safety purposes. Our adept professionals design this door viewer using the finest quality raw material and sophisticated technology in adherence with set industry standards. The provided door viewer is sternly tested against varied parameters by our quality controllers so as to ensure its flawlessness. In line with clients' variegated requirements, we bring forth a distinguished collection of the Door Viewer. The provided door viewer is manufactured under the supervision of our adroit professionals using optimum quality raw material and innovative technology in sync with set industry standards. In order to ensure its durability, this door viewer rigorously tested by our quality examiners on variegated quality norms. Covers actual minimum viewing area 180 degree (practically >142 degree). Being a client-centric organization, we are engaged in offering a distinct collection of Matt Gold Door Viewer that is widely used for safety purposes. Our adept professionals design this door viewer using the finest quality raw material and sophisticated technology in adherence with set industry standards. The provided door viewer is sternly tested against varied parameters by our quality controllers so as to ensure its flawlessness.